When your audience opens the mailbox – whether it’s at home or at the office – you have just seconds to capture their attention. If you have a well-designed direct mail piece with an engaging headline, your chances of piquing their interest may be pretty good. But what about when you’re sending something inside an envelope? The envelope you choose can definitely make an impact. Bright colors, unique shapes and sizes, embossing or foil stamping, and windows that give a sneak peek at what’s inside are all great ways to stand out. 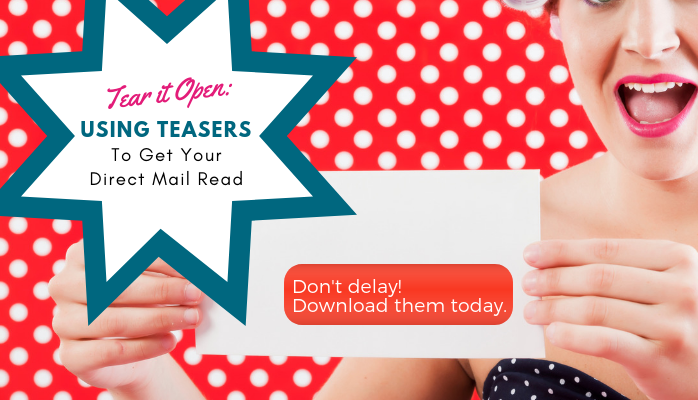 And for times when your budget or guidelines require a more traditional envelope, adding teasers – a few words that indicate what’s inside, create a sense of urgency, or allude to exclusivity – can make an impact. We recently compiled a list of teasers to help you get started. Don’t delay! Download them today.